This will be another short post on race before I move on. Many others are weighing in on race here in the United States and my voice is just one among many. I want to add that if we see race first in a person before we see them as made in the image of God as a human being, we must repent. Certainly I agree that God made us with color. All of us. But that does not define us as people. If you strip away my color, I am no different from my Japanese neighbors or my black neighbors or any other color. We are all human beings. We are all made in the image of God. This is the Christian truth. Secular humanists tell us that we are nothing more than pond scum but we are not. We are made in the image of God (Genesis 1:26-27) and we know it. We must see each other as people before we see race or culture. God does not favor the Jew above the Gentile. He loves both and sent His Son to redeem us all who are children of Adam (Romans 5:12-21; Galatians 4:1-6). 2 Look out for the dogs, look out for the evildoers, look out for those who mutilate the flesh. 3 For we are the circumcision, who worship by the Spirit of God and glory in Christ Jesus and put no confidence in the flesh— 4 though I myself have reason for confidence in the flesh also. If anyone else thinks he has reason for confidence in the flesh, I have more: 5 circumcised on the eighth day, of the people of Israel, of the tribe of Benjamin, a Hebrew of Hebrews; as to the law, a Pharisee; 6 as to zeal, a persecutor of the church; as to righteousness under the law, blameless. 7 But whatever gain I had, I counted as loss for the sake of Christ. 8 Indeed, I count everything as loss because of the surpassing worth of knowing Christ Jesus my Lord. For his sake I have suffered the loss of all things and count them as rubbish, in order that I may gain Christ 9 and be found in him, not having a righteousness of my own that comes from the law, but that which comes through faith in Christ, the righteousness from God that depends on faith— 10 that I may know him and the power of his resurrection, and may share his sufferings, becoming like him in his death, 11 that by any means possible I may attain the resurrection from the dead. Notice that this Jewish man laid down his Jewish identity for the sake of Christ. He was willing to trade in his culture, his religion, his everything for Christ Jesus. That should be our call as well. You see I am not first a white man. I am not first an American. I am first and foremost a disciple of Jesus Christ. I am a Christian. I happen to be white. I happen to live in the United States. I speak English. That is not what defines me. What defines me is the gospel. I am a sinner redeemed by grace (Ephesians 2:8-9). I was dead in my sins and my color would not change that. I was dead in my sins and my nationality would not change that. I was dead in my sins and my parents could not change that. What changed me was the gospel of the Lord Jesus Christ (2 Corinthians 5:17). “There is neither Jew nor Greek, there is neither slave nor free, there is no male and female, for you are all one in Christ Jesus” (Galatians 3:26). If we see that people are in need of Jesus because they are human beings, that is the heart of God (Matthew 28:19-20). People need Jesus. All people. All colors. All creeds. All religions. There is no other way to God but through Jesus Christ (John 14:6). He alone is our mediator before a holy God (1 Timothy 2:3-6). Jesus alone shed His blood for our salvation (Matthew 26:28; Galatians 2:15-16). Let me close this by pointing out that Paul loved his race. Paul prayed for his race to be saved (Romans 10:1). There is nothing wrong with loving your people. But don’t let that define you. Don’t allow your race to define who you are. Let the gospel inform you. Notice that while Paul loved his race, he prayed for their salvation earnestly and he also preached to those outside of his race (Acts 13:44-48). Paul even rebuked Peter for being a hypocrite with the Jews from Jerusalem (Galatians 2:11-14) because it hindered the gospel to the Gentiles. My prayer is that the Church would rise up and lead the way of preaching the gospel of peace to a sinful, hateful world. Jesus came to die for all sinners (John 1:29) and He alone can bring peace to this storm. The hope for the races is not found in government or wars. It is found in the gospel of the Lord Jesus Christ. The gospel will bring true peace. The gospel can unite sinners like nothing else. May the Lord have mercy on the United States and send us a revival of truth. Jeff Durbin is a brother I greatly admire. His zeal for the gospel blesses me. His passion to end abortion, share the gospel with Mormons and atheists has inspired me. I truly count Jeff a brother in the Lord. I’m thankful that Jesus saves sinners (1 Timothy 1:15) and not merely Arminians or Calvinists. Jesus came to save sinners (Luke 19:10) and not our theological camps. In the past I have asked Jeff to have godly non-Calvinists on his podcast. He has never responded. He has interacted with KJV-only Steven Anderson (whom Durbin labels an Arminian though Anderson himself denies being an Arminian). This is the extent of Jeff’s “Arminian” interactions. I’ve asked Jeff to have Leighton Flowers on after Jeff posted negative comments about Flowers. He has refused. 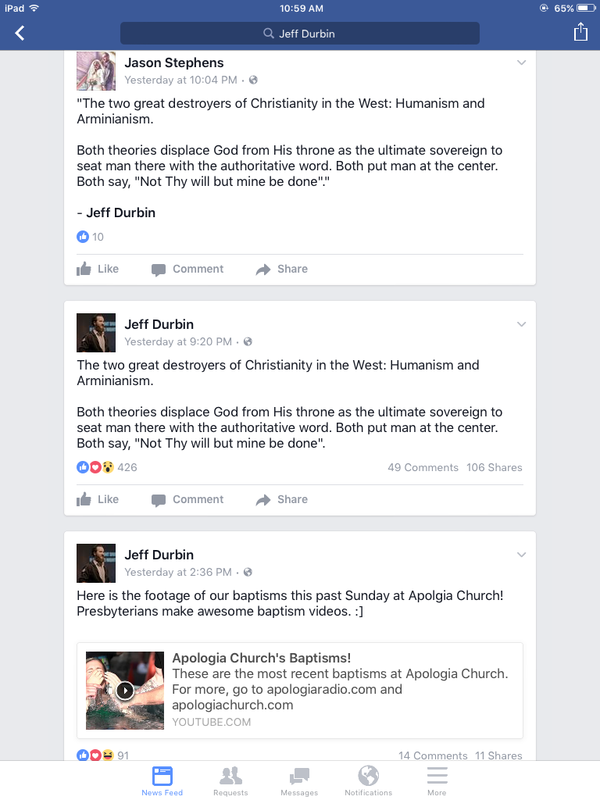 So what will it take for Jeff Durbin to change his views on us Arminians? I’ve tried to reason with Jeff but since he views me as ignorant of the “truth,” he doesn’t listen to me. I believe it will take a godly Calvinist calling out Jeff. Ironically, Jeff is a disciple of James White and while White can use language like Durbin’s, White regards Arminian Michael Brown as his brother in Christ. Perhaps Durbin could learn from White here. When I was a boy, I was raised in the Assemblies of God. My family attended an AG church that was miles from us and we would wake up on Sunday mornings and drive over an hour to church. We did it twice on Sunday and then again on Wednesday evening. Eventually they planted an AG church on our side of town and we ceased driving that far. In those days, our AG churches were clearly AG. Every AG church had the name “Assembly of God” somewhere in their name. Whether it was Airport Assembly of God, Trinity Assembly of God, Calvary Assembly of God, Northeast Christian Assembly of God, etc., the name “Assembly of God” was incorporated into the church. I remember the first AG church to not use “AG” in their name (Christian Outreach Center) and it was controversial to say the least. I remember hearing people say that COC was compromising and they were moving away from being Pentecostal. Now in fairness, I don’t think they all did this to be popular. Some would still gladly claim to be AG while not using AG in their names. Some were pragmatic and did see the “community church” movement and jumped in. I see it a different way and I’ll explain in this post. First, in the late 1990’s there were two “moves” among the AG churches I was familiar with. There was the revival movement coming out from Brownsville Assembly in Pensacola, FL. Many thought Brownsville would drop the AG name or even leave the Assemblies of God altogether but they never did and still remain to this day in the AG with the name “Brownsville Assembly of God.” The Brownsville revival died out around 2002 and the other stream took over. This was the Rick Warren stream. Warren had even been invited to the General Council of the Assemblies of God, the first non-Pentecostal speaker ever to the Assemblies of God. Warren did not know it but he became the chief of church growth to many in the AG churches. I still remember pastors at AG ministers meetings I would attend in those days all boasting about reading and implementing Warren’s purpose driven styles. Some AG pastors I knew were even following Warren’s preaching style to the point of wearing Hawaiian shirts like Warren did. They dropped preaching out of the King James Version in favor of the New Living Translation because of Warren. Secondly, this led to churches uniting around methodology and not theology. When I was a boy, the Assemblies of God were clearly Pentecostal churches. Our church was very Pentecostal in the worship and in the preaching. I remember talking to my father about the Baptist or Presbyterian churches and he would tell me they were indeed Christians but they didn’t know much about the Holy Ghost. Pentecostal theology was vital. I still remember hearing a Pentecostal pastor preach, “I fear the day when we will be Pentecostal in theology but not experience.” At every turn, Pentecostal theology was taught and emphasized. When a person got saved at our church, they were baptized in water and they told to seek God for the Holy Ghost. The wording might be wrong but they clearly knew their theology even if you don’t agree. Fast forward to today. Most AG churches I am familiar with no longer emphasize doctrine at all. In fact, doctrine is often avoided at all costs. I personally have had an AG pastor tell me that theology does not matter. He felt doctrine was not livable and so he wanted to preach “life application sermons” rather than theology to his church. Where does this come from? Rick Warren! I had another AG pastor friend who was going to plant an AG church. What did he do? In the old days, the AG’s would set up a tent and have the preacher hold tent meetings. This would usually draw small crowds at first and the preacher would preach on the need of the people to be saved and baptized in the Holy Ghost. Those who came and got saved or baptized in the Spirit were then included in the new church plant. The preacher would work until the church could support him (most stayed bi-vocational their entire lives). Now AG church planters usually get some money from the District and plant the church. They will attend numerous church growth conferences to learn the latest gimmicks to church growth. Gone are the days of fasting and prayer (though they say they still pray). In my friends case, he traveled to all sorts of churches many of them non-AG to learn their gimmicks. At one point I asked him (after he traveled to a large seeker church in the West) why he would want to learn from them since they are theological different than the AG’s? He replied, “Because they are growing and we can learn from them.” The bottom line is this: growth is desire and whoever is growing is who we look to. Theology is not the issue. Prayer and preaching is not the issue. Pragmatism is. Now my point here is not to boaster the Assemblies of God. I have no dog in the fight. I am simply observing the church world from the bleachers. I understand the desire of pastors to be full-time. I was there. I am thankful I am not now. The pressure to grow your church (and yes its viewed as “your” church) is immense. Rather than learning how to preach, how to pray, how to fast, how to evangelize, etc. the emphasis is on the latest gimmicks to get people in the door. My friend above who planted an AG church uses every gimmick you can imagine from dropping Easter eggs from helicopters (thanks to Steven Furtick for that gimmick) to offering free movie tickets to attendees to giving away a new car. All gimmicks designed to get people in the door. Once they are there, he preaches goofy sermon series’ designed to “get them hooked to church.” Sin, repentance, holiness, even AG doctrines such as the baptism in the Spirit are not emphasized. Their “worship”service is am emotional rollercoaster full of sappy love songs to Jesus and make you feel like your a 14 year old at a junior high school dance rather than church. And my friend has one goal: numbers. It’s all about the growth. His mentors are all seeker sensitive pastors and he idolizes men such as Perry Noble and Andy Stanley. Go back 50 years and not one AG pastor would have listened to a Perry Noble or Andy Stanley. Why? Because they were not Pentecostals! Pentecostals only listened to Pentecostals in those days. The attitude was that Pentecostals have the baptism in the Holy Ghost and Baptists do not. Some see all of this “unity” as good. I don’t. Again, I’m not arguing for Pentecostal theology. In many ways, my theology is more Wesleyan now than Pentecostal. I still love Pentecostal people and while I do see theological errors among them (mainly among those who claim Pentecostal such as those in the Word-Faith camp), I would not classify myself as Pentecostal. What I see taking place is not unity around the gospel. I see unity around methods. John MacArthur warned that churches today are uniting around methodology and not theology. I agree. The lines are not blurred between the distinctives of the Pentecostal movement and those in the Baptist churches. Yet it is not theological unity that is taking place. It is emotional experiences that are unifying them. There is no doubt that Jesus prayed for unity of His body in John 17:22-23. In 1 Corinthians 1:10 Paul the Apostle emphasized unity in theology. The people of God are unified who have been saved by the grace of God (Ephesians 2:14-21). Jesus is Head over His Church (Colossians 1:15-20). Jesus also knows those who are His own (John 10:27; 2 Timothy 2:19). Unity in the local church must be around theology. We must know what we believe and speak the same beliefs. Obviously, as sinful humans, we are not perfect in our understanding and we all need correction. This is why we need the church. The church helps us to know what we believe and maintain that belief through faithfulness and good works (Hebrews 10:23-25). The elders of the church help us to obtain this unity by teaching us the Word of God (Ephesians 4:11-16). Doctrine does matter (1 Timothy 4:16). The balance of all this is to have both sound doctrine (Titus 2:1) and sound experiences. I don’t want to go to church to hear a theological lecture every time. We need a balance of sound doctrine with practical living. Notice this is how Paul taught in his epistles. He would teach theology and how to put it into practice. For example, Ephesians is six chapters. The first three chapters of Ephesians are theological in nature. The last three are application in nature. Our theology transforms our lives for better or for worst. This is why Paul would issue such a condemnation as in Galatians 1:6-9 over the issue of the gospel. Without sound doctrine, the gospel is lost. Salvation is gone. The Lordship of Jesus is robbed. Life is hopeless. My friends, I urge you to pray for the Church of Jesus Christ. Pray for God to show us the need for sound doctrine. Pray for the Lord to us godly elders who are not leading for gain but for the love of Christ (1 Peter 5:1-5). Peter the Apostle wrote in 1 Peter 4:8, “Finally, all of you, have unity of mind, sympathy brotherly love, a tender heart, and a humble mind.” I want all this for myself and the church of God. May the Lord be glorified in and among His Church! The Bible is clear that there are none righteous, no not one (Romans 3:10). We have all sinned and fall short of the glory of God (Romans 3:23). Our minds and hearts are warped with sin when we come to Christ and the work of God in sanctifying us is to make us more like Christ (Romans 8:29-30). Yet even after we come to Christ, we bring years of sin, years of filling our minds with wordiness and compromise. We also bring to the Lord all our culture, our thoughts, our upbringing, our traditions. All of this must be laid before the Lord and we take up our cross and follow Him (Luke 9:23-25; 14:25-35). Of course, not all of that is sinful. Our culture may or may not be sinful. Our traditions may or may not be sinful. We must take all of them and lay them before the Word of God (1 Thessalonians 5:21-22). The Word of God is the only infallible and inerrant guide in our lives (2 Timothy 3:16-17). We submit to the Word of God (John 8:31-32). Yet this doesn’t mean we don’t bring our fallible presuppositions to the Bible. We all do. I appreciate those who come humbly to the Bible longing for the Holy Spirit to teach us as little children (Matthew 18:2-4). I acknowledge that I don’t understand everything about the Bible and there are parts I have yet to grasp. I suppose I never will. This doesn’t mean that I don’t study the Bible or don’t read difficult passages but I don’t build doctrines on passages that are not clear. Nor should you. Furthermore, we can read a passage and bring different presuppositions to the text. Take the controversy of Romans 9. When Arminius begin to preach through the book of Romans, it was at Romans 7 that Arminius first differed with the Reformed pastors of his day. Arminius argued that Romans 7 was not a Christian. This was (and remains) not the view of the Calvinists. Arminius, who at the time was himself likely a Calvinist or at least was trained by Calvinists, was willing to disagree with the theologians of his day over the sake of truth. I happen to agree with much of what he wrote about Romans 7. That said, I know that neither myself nor Arminius are infallible. Arminius brought his presuppositions to the text and so did the Calvinists of his day. Another text that is hotly debated is Romans 9. We Arminians read Romans 9 and we see the concept of corporate election all though it. We see God showing mercy to whom He desires to show mercy and hardening whom He wants to harden (Romans 9:18) but we don’t see this in the sense of individual unconditional election of people to salvation. Calvinists do. And why? Can we both be right? Could we both be wrong? We both read Romans 9 and we both seek to be faithful to the text but we read Romans 9 totally different ways. We read Romans 7 or Romans 9 or Ephesians 1 or John 6 in different ways because we are fallible. Muslims point to the divisions in the Church as proof that Allah needed to send the final prophet to unite all people. Of course, Islam is not united. ISIS is proof of that. Atheists point to John 17:20-23 as a text that shows God did not answer Jesus’ prayer since the Church is not one. Other cults such as Jehovah’s Witnesses harp on the same thing. Where is the unity? Where is the one true Church? Who is correct in their doctrine? Who is the one who is preaching the true gospel? All this does is prove that men are sinful. That is all. We are fallible. We are fallen creatures made in the image of God but sinful nonetheless. Our thoughts are not infallible. Only the Bible is infallible. The answer I believe is humility. I confess that I don’t know all things. I confess I could be wrong about Romans 9. That said, there are clear things taught in Scripture that I believe are essential and are vital to our salvation. Seeing election unto salvation in Romans 9 is not one of them. Seeing all the gifts of the Spirit in 1 Corinthians 12 as operative today or not is not essential to salvation. Seeing the “rapture” in 1 Thessalonians 4:13-18 is not essential to salvation. Seeing the book of Revelation as futurist is not essential to salvation. The deity of Christ, His miracles, His teachings, His saving work on the cross, etc. are essential. Faith is essential (Hebrews 11:6). Repentance is essential (Acts 2:38). My point here is not to be some postmodern in regards to Scripture. I believe the Bible is the inerrant and infallible truth of God given to us to reveal His salvation (John 20:31; 1 John 5:13). I am not claiming that humility is greatest virtue and we should not be dogmatic over theology. I believe theology is vital to our salvation (1 Timothy 4:16; Titus 2:1). I believe that without sound exegesis, you could be preaching or hearing about the wrong Jesus (Matthew 24:23-25). 24 And the Lord’s servant must not be quarrelsome but must be kind to everyone, able to teach, not resentful. 25 Opponents must be gently instructed, in the hope that God will grant them repentance leading them to a knowledge of the truth, 26 and that they will come to their senses and escape from the trap of the devil, who has taken them captive to do his will. The Lord’s slave should reflect their Lord who is humble (Matthew 11:29; Philippians 2:5). Our Lord Jesus gave us the perfect example for us to follow in His steps (John 13:15; 1 Peter 2:21). Jesus Himself was not quarrelsome even with the Pharisees. Yes He rebuked them in Matthew 23 but He also warned them, loved them, and ultimately (here is my Arminianism coming out) died for them (Luke 23:34; John 11:49-52). Jesus was kind to all and He taught all who would hear Him. He handled His opponents with much grace (Matthew 22:23-46). Jesus always answered His opponents with Scripture. He didn’t make it a personal issue. Jesus wanted them to repent and come to the truth. Many of them did repent after His death and resurrection including a Jew named Saul of Tarsus. While we are often willing to grant grace toward sinners, we are not willing to grant it toward our fellow disciples. This should not be. We should be humble and willing to love even that brother who disagrees with our end times view or our mode of baptism. We should be willing to preach the gospel with our Calvinists friends who disagree with us over many issues but who preach the same saving Jesus as we preach in Arminianism. Let us unite over the essentials, defend the gospel at all costs (1 Peter 3:15-16) but love each other over non-essentials and personal preferences (Romans 14:1-4). And those are the thoughts of a slave of Christ. May Jesus be glorified (John 3:30). Over the past year or so Calvinists have been debating one another more frequently. There has always been some debating going on with both Arminianism and Calvinism among those who agree but disagree over minor points. As of late, Calvinists have turned it up somewhat in their debating. Most of their debating has been over theonomy. Theonomy is the view that the law of God is still applicable to all cultures today and not merely for the Israelites. Some Calvinists believe that every nation should be under the law as its basic structure and to follow the law as the Bible gives it to us. This would include men such as the late Greg Bahnsen (whom I respect greatly) or Gary DeMar. Other Calvinists argue against this and believe that the law of Moses was just for the Israelites and not for all nations under heaven. They point out that Christ fulfilled the judicial and ceremonial law as well as being our Passover Lamb (1 Corinthians 5:7) for our moral sins. They point to passages such as Galatians 4:1-6 or Hebrews 10:1-4. I am not here to settle this issue. I think we all agree that Jesus saves sinners and this should be the heart of our message and not side issues. I welcome healthy debates but sadly these debates among Calvinists have turned pretty ugly with some on one side saying the other side is not even saved. I have experienced these sort of attacks before. It is not loving nor kind. I have received e-mails from Calvinists who tell me I am lost, that I am going to hell along with John Wesley, that Arminius is in hell, that God will judge me by the “doctrines of grace” and whether I held to them. I use to receive almost daily e-mails from a Calvinist from California who told me I was a puppet of Satan, that I was dead in my sins, that I was preaching a false Christ, that I rejected the Word of God, etc. I would always reply, “Thank you for your love for me” or “Please pray that Jesus would be glorified through me and not through casting me in hell.” After I starting just replying, “Romans 5:8” he gave up. I suppose he is still out there praying for us Arminians to be saved. Another guy on Twitter use to send me tweets almost daily seeking to debate me over every little word that I wrote. I could post on prayer and I would get a tweet from him wanting to debate the sovereignty of God. If I posted something about my children he would tweet me and ask me about the doctrine of unconditional election. I finally blocked him altogether. In fact, on Twitter there are a group of Calvinists that spend their time watching Twitter for any tweets on Calvinism. All you have to do is go onto Twitter and hashtag #Calvinism with something negative about the system and watch them come to life. They will tweet you hundreds of times till you either block them or pull down the tweet. Then there are the followers of Dr. James White. Now I will admit up front that I regard Dr. White as a brother in the Lord. I enjoy his works. I listen to his podcasts (until he goes off on Arminianism). His works on Mormonism have been a source of great help to me over the years. He was one of the first apologists that I ever heard of and read as a young disciple of Christ over 20 years ago. I was shocked to learn he was a Calvinist but this has not stopped me from loving him and appreciating him. Yet Dr. White has an army of loyal followers who follow him completely. If you ever question Dr. White, these folks will come out like ants to defend their man. Dr. White will occasionally jump in with them but he normally stays out. They are on Twitter and Facebook but they are out there defending Dr. White as the greatest apologist in the history of Christianity. I suppose there are Arminians out there like these above. I don’t know of any. I am not one for sure. I would disagree with Calvinists all day on Twitter or other forms of social media but my battle is not against Calvinists. I simply want to exalt Christ, see the gospel go forth, and yes, along the way, promote biblical theology as I see it and that would be Arminianism. I have been called a raving Arminian only once and I believe this brother go me wrong (he lives in the UK and doesn’t know me). Most who do know me including my Calvinist friends are often shocked to find out that I am an Arminian. It is not what I seek to promote. My agenda is not to exalt Arminius. In fact, I don’t care if people know who is Arminius is or not. I appreciate the man but he is not the one who is worth praising. Jesus alone is! 12 What I mean is that each one of you says, “I follow Paul,” or “I follow Apollos,” or “I follow Cephas,” or “I follow Christ.” 13 Is Christ divided? Was Paul crucified for you? Or were you baptized in the name of Paul? I ask the same: Is Christ divided? Was Arminius, Calvin, Edwards, Spurgeon, White, Campbell, Reasoner, Owen, Watson, etc. crucified for you? Or were you baptized in the name of Bunyon, Ravenhill, Tozer, Lewis? The reality is that we divide over issues that are not truly related to the gospel. I know some will contend that Calvinists have the gospel messed up or that Arminians promote works-righteousness but if you stop and ponder these things you will learn that we both get the gospel right but we divide on how we get there and sometimes what takes place after. I heard Dr. Douglas Wilson say to an atheist who asked him why if you gave five people each a Bible and put them in a room all by themselves and told them to just read the Bible, why would the five people come out with five different views. Wilson answered that this is not an attack on the Bible nor upon the gospel but upon the sinfulness of man. The fact is that five people with five different views shows us nothing about God nor His Word but rather it shows us that we should not trust people and their opinions. I agree. I am an Arminian in my soteriology but this does not define who I am. I am much more than just Arminius and his works. In fact, I don’t agree with all that Arminius wrote. My Arminianism is not what defines me nor does it dominate me. I read all sorts of Christian theology and I have hundreds of Calvinist books and commentaries. One of my favorite study Bibles is The MacArthur Study Bible. I appreciate many Calvinist theologians and preachers. I am not blinded by my Arminianism to not appreciate Calvinism nor what they offer to me as a child of God. The reality is that Jesus Christ is the One that I adore the most. The sinless Son of God is the One whom I pray to, worship, long to be like, rejoice that He shed His blood for my sins. I long to go to heaven to just be in His holy presence. Heaven will be heaven because of Jesus and not because of any theologians who will be there. When I was lost, Jesus found me! When I was dead in my sins, Jesus gave me life! When I was blind, He opened my eyes so I could see! Jesus is my life (Colossians 3:4). If people hear about Wesley, they might be smarter when they leave me but still dead in their sins (Ephesians 2:1-3). If they hear about Arminius, they might be impressed with his life but they will not have eternal life (John 5:24). If they hear me talk about John Calvin, they might agree that he was an exceptional expository preacher but they will walk away still under condemnation from sin (John 3:18). If I explain to someone theonomy, they might agree that the law of God is good (1 Timothy 1:8-11) but if the law doesn’t show them their sins and lead them to Christ, what is the point (Galatians 3:22-24)? I can possibly try to explain my view of the millennial reign of Christ but if they don’t know Christ, what is the point? I am not demeaning the need for sound doctrine nor am I seeking to demean the need for theological debates. We need them (see Acts 15). Yet at the same time, if Christ is not being preached, if His cross is not being lifted up (John 12:32; 1 Corinthians 2:2), what is the point? Christ is the One who alone is worthy to be praised and sinners need to hear the truth of the gospel to be saved by His grace (Romans 10:14-17). Christ is our salvation and not any theologian (1 Corinthians 1:30-31). My earnest prayer is for the Church to exalt Christ. We have over 35,000 denominations. This doesn’t disprove the truth of the Bible nor does it disprove the validity of the existence of God (Romans 1:19-20) but it proves that man is fallible and sinful at heart (Jeremiah 17:5-9). Most denominations started out simply longing to restore the Church back to the centrality of the gospel. Somewhere along the way they became focused on man and his agenda took over. This is why we have 35,000+ denominations. Our hope, nonetheless, must be on Jesus Christ. No church will save us. Only Christ will save sinners (1 Timothy 1:15). The reality is that Jesus has only one Church and it is those who are His true disciples (John 8:31-32). There are doctrines that we disagree with our Calvinist brethren over. We disagree over the decrees of God. We disagree over whether we have retained free will after the Fall. We disagree over what Adam has passed to us. We disagree over the extent of the atonement. We disagree over whether election is conditional or unconditional. Yet the doctrine of Scripture should be a doctrine that we agree on. After all, it is the preaching of the gospel that brings salvation (Romans 10:14-17). Paul the Apostle stated clearly that the preaching of the cross was foolishness to those who are perishing (1 Corinthians 1:18-25). The preaching of the gospel is necessary to bring about the salvation of sinners (Matthew 28:19-20). So it would only logically make sense for us to take a firm stand on the authority of the Bible. The Bible is given to us by the work of the Holy Spirit working through godly men to bring about His holy Word (2 Timothy 3:16-17). Jesus said that the Word of God cannot be broken (John 10:35). Jesus further said that His Word would never pass away (Matthew 5:17-18; Luke 16:17). How is then that some Arminians want to reject inerrancy of the Bible? Some reason that this is not a biblical position noting that the word inerrancy doesn’t appear in the Bible. I would note that the word Trinity is not in the Bible either but it is based on reasoning from the Scriptures. The same is true for inerrancy. We base our view of the Word of God on what God has already said about His Word in the Bible. The Bible says that God cannot lie (Numbers 23:19; Titus 1:2) so what He says in His Word is absolutely true. Some will contend that this is circular reasoning but it is biblically true. Proverbs 30:5 says that every word of God proves true. This is true of Genesis 1 as well as John 1 or Philippians 1. Others want to say that they believe in “salvation inerrancy” meaning that only passages related to salvation are inerrant. My question: how do they know that John 3:16 is true if they can’t trust what God said in Genesis 2? The reality is that those hold to this “limited inerrancy” view are in fact placing themselves as the judge of Scripture (or at least others such as scientists or secular historians). Only those who hold to full inerrancy can truly believe that what God said in 2 Timothy 3:15 is true just as what God said in every portion of Scripture. We assert, that the arguments which, contained in the Scriptures, prove the Divinity of the religion prescribed in them, are so full and perfect, that no arguments can be derived for the defense of any religion which are not comprehended in these, and in a more excellent degree. (2 Cor. iv, 2- 6.) They are indeed of such high value that the truth of the Christian religion is established by them as strongly, as it is possible by any other arguments to prove that there is any true religion at all, or that a true one is possible. So that to a man who is desirous of proving, that there is any religion which is true, or that such a religion is possible, no way is more compendious and easy than to do so by these arguments, in preference to any other which can be deduced from general notions. But the most wonderful of all is, that the very thing in the Christian religion which seems to be one of the greatest absurdity, affords the most certain proof of its Divinity, it being allowed to be a very great truth — that this religion has been introduced into the consciences of men by a mild suasion, and not by the power of the sword. (1 Cor. i, 29-xxiv, ; 2 Cor. v, 11; Luke ix, 54, 55.) Of a similar tendency is the argument formerly used by St. Augustine: “If the Christian religion was established by the miracles which are related in the Scriptures, it is true; but if it was not, the greatest of all miracles is, that it has been able to obtain credit without miracles.” For the internal suasion of Him who alone can work miracles, ought to stand in the place of miracles outwardly performed, and to be equally potent. (Rev. ii, 17.) And thus the very narration, contained in these books, of the miracles which were performed in the early ages in proof of the doctrine, is now, through a most beautiful vicissitude of circumstances, proved to be true by the Divinity of the doctrine when subjected to examination. This is that word of God which remaineth forever, of which, though heaven and earth pass away, one jot or tittle shall not pass away. The Scripture therefore of the Old and New Testament is a most solid and precious system of Divine truth. Every part thereof is worthy of God; and all together are one entire body, wherein is no defect, no excess. I hold with both Arminius and Wesley that the Bible is true in all that it affirms. Some want to even use the term “inerrancy” but they only mean that the Bible is inerrant when it speaks of salvation and not historical or scientific truth. I affirm that the Bible is true in all that it affirms. While the Bible is not a science book or even a history book per se, it still is true in what it affirms in regard to science or history. I hold that the Bible is true in Genesis 1-11 and equally true in John 1-11. There is no difference. Whatever the Bible affirms is true because the very Spirit who has given us the Bible is the Spirit of truth (John 15:26). Jesus Himself said that the Word of God is truth (John 17:17). I find it alarming further that people who claim the infallibility of the Bible but deny its inerrancy will say that the Bible contains errors. While they don’t produce any without their own presuppositions, they suppose that the Bible does contain errors. 2 Timothy 3:16 says that all of Scripture is breathed out by God. Those who will say that the Bible is not true in whatever it teaches is making a grave assumption of God, that is that 2 Timothy 3:16 is not true since they would argue that such and such passages are in error. They first make themselves the judge of Scripture as to what is true or not while ignoring their own utter sinfulness and faulty understanding in light of their own sins (Romans 1:21-22). God alone is perfect in His wisdom and understanding yet sinful men will claim that they know where God has erred in His Word while ignoring 2 Timothy 3:16. They claim that some parts of Scripture are indeed inspired by God such as John 1:12-13 but they will not say that all of Scripture is inspired of God despite 2 Timothy 3:16. I fear for them before a true and holy God. I am not saying that such people are not saved (for God saves us by His grace and not based on our perfect theological understanding; Ephesians 2:8-9) but I do believe them to be calling God a liar no matter what they may argue. There is a fear among some Arminians to join hands with our Calvinists brethren to defend the doctrine of inerrancy. I reject such a view. I rejoice that many godly Calvinists are indeed declaring the truthfulness of Scripture and affirming the inerrancy of the Bible. I rejoice that God is using many godly Calvinists to glorify His name. Whether they be Arminians or Calvinists, if the Lord Jesus Christ is being exalted, worshipped, adored, and praised, I rejoice in those who preach Him! I will gladly join with my Calvinist friends in preaching the Lord Jesus and I will gladly join with them in defending the truthfulness of the Bible. Others are fearful that holding to inerrancy automatically means that we ascribe ourselves as “fundamentalists.” I myself have no problem being labeled as such. Certain aspects of current Baptistic fundamentalist trouble me and I am not a King James Bible only advocate. I find the KJV only position to be illogical. That said, I do agree that the fundamentals of the faith are worth defending (Jude 3). I believe strongly in many fundamentalist positions of doctrine such as the virgin birth of Christ, His sinless life, His miracles, His vicarious atonement, His death and bodily resurrection and His ascension to the right hand of the Father. I ascribe to many of the creeds of Christianity and affirm, yet again, that the Bible is true in all that it affirms. I study my Bible each and every day because I love the Word of God and long to know it more. In conclusion, the Bible is the Word of God. The very claims of Scripture are that it is true. The Lord Himself spoke in Isaiah 45:19 that He speaks the truth. Again 2 Timothy 3:16 says that all of Scripture is God-breathed. The Bible is given by the Spirit of God whom is called the Spirit of truth. The authority of the Church to proclaim the risen Christ, His salvation, and His judgment to come is based on the Word of God. The precious promises of heaven and eternal life are based on Scripture. The foundation of human thought and wisdom come from the Scriptures. Our authority in evangelism is based on the truthfulness of Scripture. Our authority to preach the forgiveness of sins is based on the absolute truth of the Bible. So I stand with my Calvinist brothers and sisters who preach the inerrancy of the Bible. I will gladly join with them in defending its truth and I believe that every Arminian should do the same. Should Arminianism or Calvinism Be An Issue For Unity? I want to say from the beginning that I enjoy various Calvinist blogs, podcasts, and ministries. My wife and I have financially supported a few Calvinist ministries now and again. I have no trouble praying, worshiping, fellowshipping, and even evangelizing with my Calvinist brethren. I would stand with my Calvinist friends to defend the gospel, to defend key doctrines such as the inerrancy of the Bible, and I would stand with my Calvinist brethren to preach the gospel. I have no ill will toward my Calvinist friends. I simply believe they are wrong in their starting point for their theology though I regard them as brothers and sisters in the Lord. If I had a larger ministry context, I would not exclude Calvinists from my group. I would love to have a ministry that reaches people with the gospel much like Ray Comfort’s Living Waters or Paul Washer’s Heart Cry Missionary Society. In Ray Comfort’s ministry, it is well known that both Arminians and Calvinists have served together with one another. There has been unity even in the midst of theological disagreements. The reason is simple: the gospel is not about Arminianism or Calvinism. One can be an Arminian or a Calvinist and be lost. This is clear from our churches were people attend but are lost. There are many people who would claim to be an Arminian or a Calvinist but are not saved. Salvation is not an ism. Salvation is found in the living Savior, the Lord Jesus Christ (1 Corinthians 1:30-31). Salvation is found in Jesus alone (John 1:12-13; 14:6; Acts 4:12; 1 Timothy 2:5-6). Salvation is not agreeing with facts about Jesus (James 2:19). Salvation is loving Jesus and worshiping Him alone for His saving work on the cross (John 14:21-24; 1 John 2:3-6). Silence by Living Waters regarding various theological or philosophical issues should not be seen as a position in favor or against those various theological or philosophical issues. And all members of the Living Waters staff are free to believe, study, worship, and fellowship according to their personal convictions and preferences, without compromising their deeply held spiritual beliefs, so long as those beliefs, convictions, and preferences are consistent with the ministry’s Statement of Faith. A Christian can be a non-Calvinist without being anti-Calvinist in their doctrinal positions; just as a Christian can be a non-Arminian without being anti-Arminian. I agree with Tony Miano here. I agree that one can be a non-Calvinist and not be anti-Calvinist. That would describe myself and so many other Arminians I know. I am not against my Calvinist brethren but I am not a fan of Calvinism. I can read Calvinist books, pray with Calvinist saints, preach with my Calvinist brothers, and yet not agree with Calvinism. Why? Because Calvinism is the not the gospel. Jesus doesn’t save Calvinists nor does He save Arminians. Jesus saves sinners (Luke 19:10; 1 Timothy 1:15). Yet Miano recently stated in his blog talk radio program that Arminianism is the problem with the American church. He blamed the “sinner’s prayer” and altar calls on the Arminianism of the 19th century here in the United States. He went on to rant that Arminianism is one of the unbiblical problems in the American church (along with some other things). I have watched this slowly developing in my brother Tony. I am not like some who will call Tony a liar nor will I berate him as a sinner. I love Tony Miano and love his work for the Lord. I appreciate his heart to preach the gospel to the lost. I appreciate his service for the King. I don’t agree with Tony on every issue. His Calvinism is often where we disagree. That said, I appreciate him as a brother. I would ask he do the same toward me and other Arminians. What I would like to say to Tony (and other Calvinists) is this: read Arminians. I wonder when Calvinists attack Arminians, have they read the Works of Arminius? Have they read any Arminian theologians such as Adam Clarke, Vic Reasoner, or Roger Olson? Do they know the Arminian Puritan John Goodwin? Have they read the writings or sermons of John Wesley? Do they know that Whitefield said that Wesley did evangelism better than he did for Wesley put his converts into bands or small groups? When was the last time they had meaningful time with Arminian brothers and sisters and talked about theology with them? The fact is that if brother Tony had read Arminius or the works of Arminians he would see that what he berates as sloppy American evangelicalism does not come from Arminius nor the Arminians of the 19th century but rather from the semi-Pelagianism of Charles Finney. While many Calvinists try to make Finney an Arminian, he was not. I would admit that many Arminian churches fell prey to Finney’s theology at the turn of the 20th century and sadly many Arminian churches today look more like Finney than like Wesley. Dr. Vic Reasoner in his excellent two-volume work, Holy Living, shows that Finney’s theology does not reflect the teachings of Arminius nor Wesley regarding salvation, sin, holiness, etc. I recommend the book. I appreciate my open air brethren who happen to be Calvinist. I would appreciate if they take the time to read Arminians. I suspect many will not because they have begun with a presupposition in mind and that is that Arminianism equals man-centered theology, that Arminianism equals heresy, or that Arminianism is not God-exalting theology. All of this is false. I confess that Arminian books are not as easy to find as Calvinist books but they are there. I would appreciate them reading Arminius or reading Wesley and seeing that the current state of the American church has nothing to do with Arminius or Wesley but with the teachings of Finney. Let me end by asking my Calvinist brothers to not do one thing and that is draw a line in the sand with Calvinism being the gospel. I heard Jeff Rose from Jeremiah Cry (a ministry I support and appreciate again in spite of their Calvinism) saying that he was going to start making a call for people to abandon all forms of theology but Calvinism to work with them. I ask why? If Calvinism is not the issue? If Calvinism does not save? If Calvin was but a man who saved no one? Why do this? Why make Calvinism a gospel issue? Let us return to the gospel. Let us return to preaching the gospel and uniting around the fact that the blood of Jesus saves us from the wrath to come (1 Thessalonians 1:10). Let us draw near to God through the Lord Jesus Christ through His precious blood (Hebrews 9:14).